Surely one of the most direct, honest and accurate depictions of life in the "Old West," the Grey Fox does not resort to violence, bluster or machismo to present its story. Instead, the film comes across as a story of a man whose life has gone wrong as the result of carefully thought out and well-reasoned choices, though nevertheless bad choices. This alone is particularly refreshing in a Western movie and makes the film a worthwhile experience. The late Richard Farnsworth relies on his considerable skills as an actor and makes his character sympathetic and heroic, never losing sight that he is in fact a thief. The costumes, setting, dialog and yes, even the miserable weather are true to the historical period and makes the viewer feel as if they were there alongside the characters in this elegant story. That song takes me back to a childhood time, when I lived near a train switching yard. I loved to be there when a train got ready to leave. The engines emitted steam, and, as they set out to start rolling, the pistons gave short bursts of action that made the driving wheels spin like crazy. Spin, and the train would lurch, car by car, jolted. I don't know how many times they did this, but the train very shortly picked up speed. The engineers always waved, as did the crew in the red caboose at the end. It was a great disappointment when diesels replaced those wonderful machines. A part of my personal world forever died. I don't know this film, dys. As much as I love a western, I know I will look to view it. I am saddened by the demise of the caboose. We dont seem to have them on trains anymore. Do they still have them on the long trains that carry our salad greens from California to Chicago? Im gonna call Mrs F and tell her to add Grey Fox to our Netflix que. I have not seen the interior of a caboose, but I would not be surprised if they had at least a rudimentary kitchen. Why not, on a long ride? He made uncredited appearances in numerous films, including Gone with the Wind (1939), Red River (1948), The Wild One (1953), and The Ten Commandments (1956). He was on the set of Spartacus (1960) for eleven months. He laughed when he said he did not look like a gladiator, but drove a chariot. However, it was not until 1963 that he finally received his first acting credit. As children, as even as adults, we are often fascinated by trains. If we have to stop our cars for a train, we count the many cars that pass by. People have model train sets, and a very popular children's television program and book series is Thomas the Tank Engine. Throughout most of the 1900s, people expected to see a caboose at the end of the train. Today, cabooses are a thing of the past. No longer does a caboose signal the end of the train; instead, old cabooses are parked in various places around the United States, sometimes rusting in junk yards, or at other times finding new life as the home for a small shop or tourist site. Railroads began to emerge in the United States in the decades preceding the American Civil War, and they continued to grow throughout the rest of the nineteenth century. Very early on, trains began to put a caboose on the end of each train. Aside from the locomotive, where the train engineer and other workers might stay, the caboose was the only other train car to house train employees. In addition to the train conductor, who used the caboose as an office to handle the paperwork associated with the train's cargo, the caboose also housed a brakeman and a flagman. Some cabooses had a cupola on top, which allowed either the conductor or another employee to ascend to view the train from above and to look for potential dangers. Early cabooses were made of wood, but eventually they were constructed from steel instead. 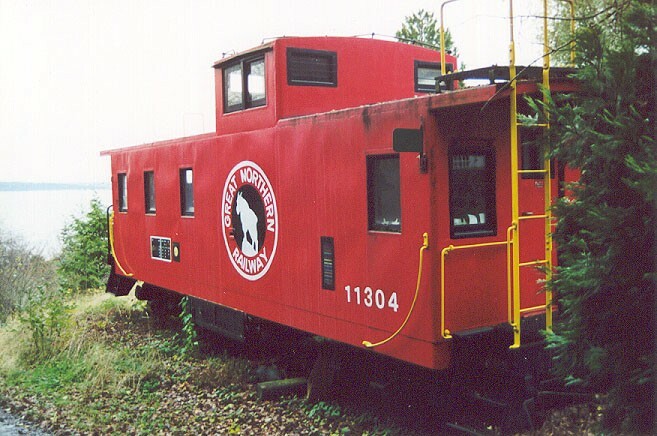 Probably the most common caboose color was red, but it was possible to see yellow, orange, or other colored cabooses occasionally. Railroad employees had a number of slang words that they used for the caboose, such as "crummy," "clown wagon," and "waycar," among others. Improved railroad technology eventually led to the demise of the caboose. Even in the late 1800s, some railroad employees were no longer needed because of improvements in technology. Early trains had required brakemen to set the brakes on each individual train car by hand, but automatic brakes made that process unnecessary. Railroad companies constantly sought ways to make railroads safer and to cut down on the number of accidents. One result of this effort was the introduction of electronic signals on the tracks. These electronic symbols made flagmen obsolete. As the process of keeping track of cargo paperwork was computerized, conductors no longer needed to process mounds of paper. Today, trains have replaced the caboose entirely with a radio device called an EOT, which stands for "End of Train." The EOT can pick up and send electronic signals along the tracks, and it has made the conductor and caboose unnecessary on modern trains. The EOT is also known as FRED, or "Flashing Rear End Device." I hope they have blocks under the wheels of that thing. I always see cabeese in peoples back yards and wonder how the hell they gottem there? While looking for a place to post that song, I realized that only a thread like this might accommodate such. That caboose looks as likely there as a battleship. Heres a caboose motel in Lancaster Pa. Sorry about the pic, I copped it from an ad. An old Delmore Brothers tune"Blue Railroad Train" done by Doc Watson. If you want to learn what is called "Travis " pickin, this video is a big help. When I was a kid I tried chewing tobacco and was heavily influenced by the ad on a barnside along the PA turnpike which we used to pass every time my Dad and I went fishing at Hopewell Lake. I got really really sick and have never been tempted to chew or use snuff. These ads are a scene thats passed .